My last post talked about the ambitions of Mythstories Museum to relocate to Wellington, and the opportunity that has recently been missed by Telford & Wrekin’s sale of the old Wellington Library buildings – which could have been a perfect home for the project. Since then, museum leaders Dez and Ali have been in touch with another idea – building a new home from scratch, somewhere in the town, using shipping containers. It’s a bit left-field, but doesn’t come entirely out of nowhere. 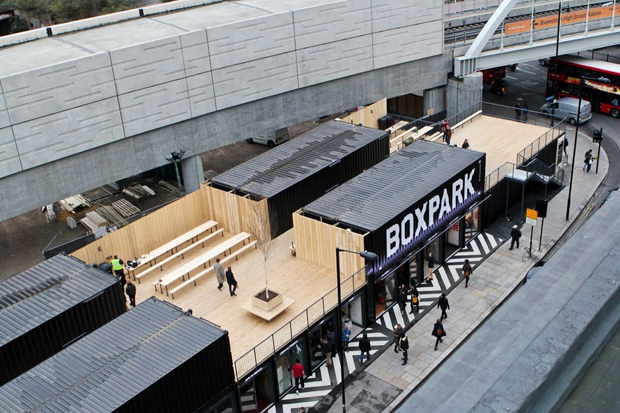 The recycling of shipping containers as a building material is happening in cities all over the world – including just down the road from where I live in East London, where Boxpark (see below) has turned several into a pop-up retail area, complete with roof-top bar. Elsewhere, they have been used to create office space, exhibition spaces and even homes. They’re relatively easy to assemble, environmentally friendlier than most building projects, and can be architecturally brilliant. So – Dez and Ali are wondering what you all think about the idea of a museum-come-youth project housed in a suite of former shipping containers, somewhere within the bounds of Wellington. Is it worth exploring? Or would Wellington run a mile from an idea like this? They sent me a PDF with a few photos and thoughts on ‘Containers to contain us’ – so click here to take a look …and as always, feel free to comment at the bottom. Anyone who follows Kevin McCloud’s exploits or ‘Georges amazing spaces’ will know that this isn’t a totally new concept. They would also appreciate the benefits to adapting these containers. I think they’re brilliant, and yes, Wellington has certainly missed the opportunity to put itself on the map as being progressive and a ‘happening’ town! I got Mythstories in to work on my Streetkids project at Blists Hill years ago, and took a class of children to visit them too. The children absolutely loved the time they spent with Dez and Ali. Would be fantastic to have Mythstories closer to us in Telford. I would definitely bring more classes to visit them. The containers sound like a good start for a relocation!